Dave's Long Box: Haappy Birthday Youngster! 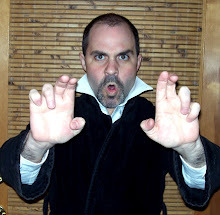 Dave's Long Box gives a tip o' the hat and a jaunty salute to Chris Sims of The Invincible Super Blog, who on most days is my nemesis, the Sabretooth to my Wolverine. Today I'm burying the proverbial hatchet on account of it's the young fella's birthday, which means he can legally fornicate with womenfolk in South Carolina. Happy birthday you scrappy lil' rascal (ruffles Sims's hair playfully). 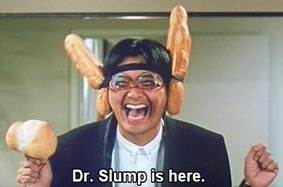 Dr. Slump will see you now, Sims! You mean Chris turned 12? Awww...that's adorable. Chris is a big boy now! What on earth is that picture from? That is because it is Chow Yun Fat. It is from the HK movie, "Daai jeung foo yat gei"... english title "The Diary of a Big Man"
It is one of the Chow Yun Fat comedies.